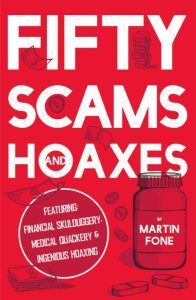 Fifty Scams and Hoaxes is a light-hearted investigation into some of the worst examples of financial skulduggery, medical quackery and ingenious hoaxing from history. Along the way we will come across a Pope advocating a drink based on cocaine, a pill to avoid hangovers, a woman who gave birth to rabbits, the man who broke the bank twice, the first examples of insurance fraud and scam emails and much more. Author Martin Fone explores the psychology and methodology deployed by the scammers and shows what can happen when avarice preys on credulity and gullibility. The key characteristics he unearths amongst his despicable gallery of scammers includes; incredible claims, creative use of advertising, playing on people’s fears and aspirations, unscrupulous business practices and, when it all goes wrong as it often does, a propensity to flee the scene and leave others to pick up the pieces. Well-paced, fascinating, entertaining and informative, this book will delight the general reader as well as providing food for thought for the more serious student of the foibles of human nature. About Martin: A Classics graduate from Trinity College, Cambridge Martin Fone had a successful career in the insurance industry. He co-authored two books on public sector risk management which were adopted by the Institute of Risk Management as their standard text books. Since retiring Martin has had the opportunity to develop his interests, mainly reading, writing and thinking or, as his wife puts it, locking himself away in his office for a few hours a day. In particular he has been blogging and writing in his tongue-in-cheek, irreverent style about the quirks, idiocies and idiosyncrasies of life, both modern and ancient. 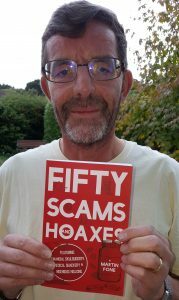 His latest books, Fifty Clever Bastards, Fifty Curious Questions, and the soon to be published Fifty Scams and Hoaxes reflect this change in direction. In May 2018 Fifty Curious Questions was a Category Finalist in the Eric Hoffer Book Award 2018 and has been serialised inCountry Life magazine’s social media platform.